Find and hire the right people, maximise retention and nurture success. Dynamics 365 for Talent is a comprehensive set of HR applications with Office and LinkedIn integration. Manage and automate workforce administration for both full-time employees and contractors. Dynamics 365 for Talent comprises three applications: Core HR, Attract and Onboard. Talent can be integrated with existing systems to streamline processes and optimise workforce costs. Tight integration with LinkedIn Recruiter draws together disparate information to build accurate candidate profiles and improve the ROI of the hiring process. 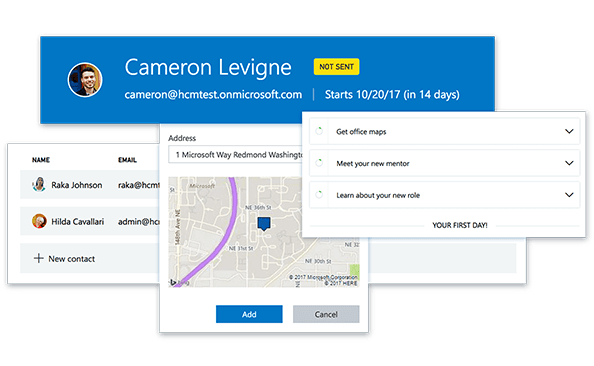 Office 365 integration offers easy scheduling of collaborative interviews with Outlook, and data management with Excel. Enhance the process of talent sourcing, recruiting and selection with LinkedIn Talent Solutions. 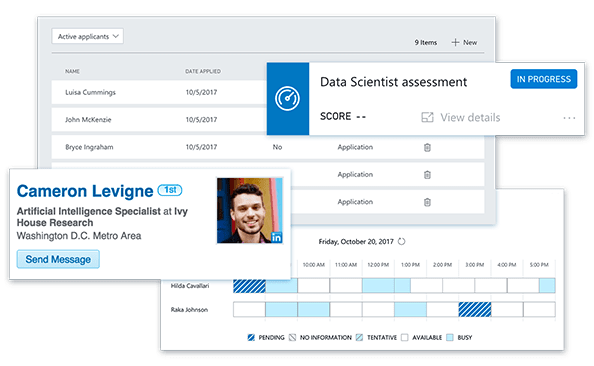 Simplify interview scheduling with central visibility into candidate profiles, assessment tools and interviewer assignments. Offer collaborative performance assessments with real-time performance dashboards and accomplishment tracking. Automate routine HR tasks such as benefits, compensation, and leave and absence. Simplify employee verification, worker accommodations, local regulation support, and health and safety requirements. Configure automated processes to reduce paperwork and reporting complexities, improve accuracy, and minimise compliance risk. Adjust compensation individually or in bulk, and test in a sandbox environment prior to approval and publishing. Define leave and absence types with job-related filters and assign groups of employees to a leave plan. Integrate with other Dynamics 365 apps and existing systems through a common data platform. If you're considering Microsoft Dynamics 365 for Talent, or just want more information, we're happy to answer all your questions.